It is amazing for me and the entire student body and staff of CBIW to say hello. 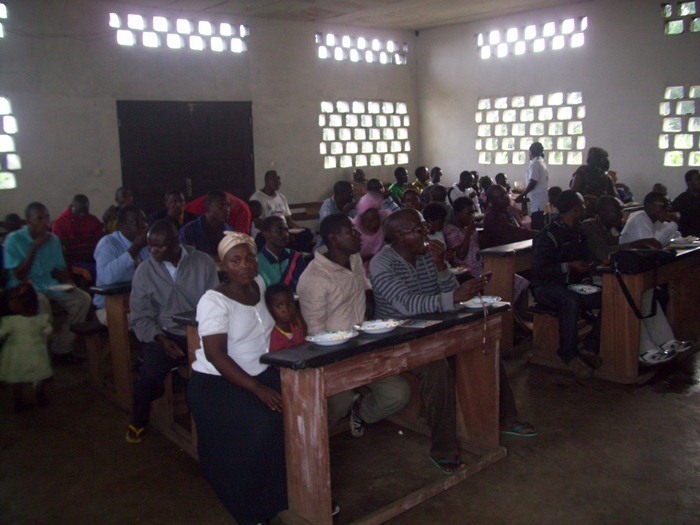 May God richly bless you all for your kindness toward us, and your prayers toward the work here in Cameroon. Brother Eddie Samuel baptized Christian Ndiko in the Wotutu congregation in the cause of this week. Remember him in your prayers to walk worthy of his calling. I do hope you are all doing great in all that you do. Our prayers for you are that God keep watch over you and bless all your endeavors. I come before you today appealing for you to join me to thank our God for adding one more year in my life today. Today is my birthday, as we had some special prayer session after worship today for me, my family and all the work entrusted to my hands. I am 34 years old now. My blessings are many. Above all I was called by God to serve Him in the capacity of an evangelist. I am excited about my calling and I pray He use me in many levels to fulfill His words through me. Some students, three of them, went to Tole over the weekend for weekend evangelism. God blessed their effort with three souls as they were added into the small struggling Tole congregation. Please keep them in your prayers. All our programs in CBIW went on well. Our devotionals and our chapel periods were wonderful. Thanks to God for using both the students assigned to speak in Chapel to do it with happiness. I am excited about them because I can see daily growth in their lives. This week was also a memorable one as the second quarter results were released with great improvement from our students. Please keep these soldiers who are being trained to enter into the warfront in the near future well-armed to defend the gospel of Christ. Brother Muofo Bernard baptized Ambe Rene over the weekend in Tole as they were busy during their weekend evangelism. Pray for the brother to keep the faith. Brother Ambe Rene also told the news of his baptism to his sister who is a nursing mother, the students went into their home and shared the gospel and Maureen Ambe who also accepted the truth and put on Christ. See the picture below and to the right. Please remember them in your prayers that they should be an eye opener to the rest of the family who are staunch denominational followers (Presbyterian). This afternoon was another moment of joy in the life of the church in Wotutu, as the church came together to watch videos from WVBS in church with invites as part of the celebration of my birthday. 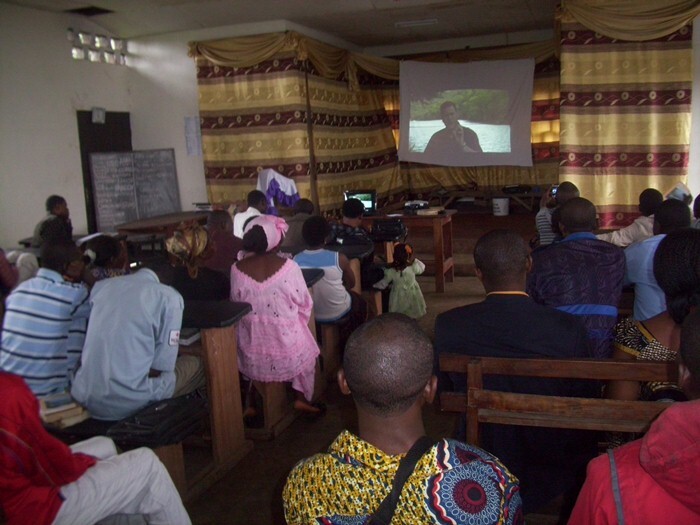 The church used the projector device donated by brother David Ballard to project the lessons from WVBS and also the matriculation ceremony of the CBIW students. It was wonderful. Over 120 people were in attendance. The church has decided to put projection of DVD from WVBS as part of their weekly program where visitors will watch touching lessons like that of John Moore and others. During my birthday celebration, it was also time to have fellowship with one another, as brethren spend time to sing praises to God and to pray for many more and fruitful years for me to serve in the vineyard of the Lord. We shall be moving with the students to Batoke village to plant a church. Please remember us in your prayers for us to have the means to go, so that we shall lay the ground work. We shall continue the work when we have all that it takes to perfect the evangelistic effort of the village. We still need a lot of other things. 1. The school needs a digital public address system which will help in evangelizing Wotutu village and other villages that we shall go for outreach. 2. The problem of a van is still serious with us as it hinders our movement. Students who travel to Tole this weekend did that under the rain to make it to Tole. We give thanks to God for using the students and three souls were added to the church there. Rains and mud could not stop us because the gospel is for all. Please do your best to share our troubles. We thank you for all your prayers, concern and support for the smooth running of our program. I pray that God bless you and replenish all you are doing for us. Do your best to share this report with others who may be of help to us. Thanks for your love and care. Stay safe in Christ, as you continue to think souls. Posted on July 31, 2011 by Bob Turner and tagged Cameroon.